Born in The Pas, Manitoba, she resided there with her family and began piano lessons at the age of four. Her elementary school years were spent at Sacred Heart Catholic School directed by Sisters of the Presentation of Mary. During these years she pursued activities with Brownies and Girl Guides and enjoyed many outings to Clearwater Lake, all the while perfecting her remarkable piano skills at such a young age, winning all the categories she entered in the annual Music Festivals. She loved to tag along with her cousin Rita Rainville and many friends. During her years at The Pas High school she enhanced her musical repertoire to include playing at dances and leading the Cathedral junior choir. In 1955 she married Colin Roberge of Bowsman, Manitoba and took up the challenges of wife, mother, and homemaker at their family farm. Over the years she enhanced the farm’s gardens and shared her musical talents with her children, the local schools and across the Swan River Valley near and far. 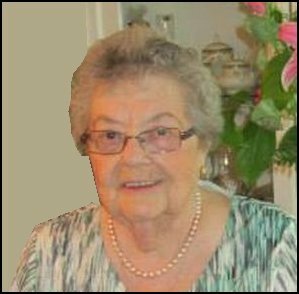 Her dedication to St. Columba’s Parish and Missions meant providing organ and choir services for nearly 60 years and the number of weddings, talent nights, and music festival entrants all in need of accompaniment are too numerous to recount. She touched the lives of thousands with her refined talents and is remembered for making time for everyone on top of a busy schedule as wife and mother. She was predeceased by her parents Albert and Melina La Fontaine, brothers Marcel, Ernest, Victor, and Arthur; sister Germaine, and by her husband Colin of 55 years to whom she committed a special bedside devotion over his remaining years as a resident of the Personal Care Home. She is survived by her eldest sister Olive Wadelius of The Pas; children Robin (Ronalie), Renée (Peter), Marcel (Les), Arthur (Craig) and by grandchildren Tanis, Aaron, Alina and Tessa, then great-grandchildren Kayle, Aiden, Draven, and Rhiannon. The staggering list of nieces, nephews and cousins will all hold special memories in their hearts that Jeannette spent time with them over the last seven months as she was able to travel and relish in the company of each treasured family member and friend. Mass of Christian Burial to be concelebrated at St. Columba’s Roman Catholic Church upon Friday 13th September 2013 at 2 P.M. with the Reverend Fathers John McKenzie and Roy Vazhaplankudiyil officiating, and Organist Tanis Asselsteine of The Pas heading the musical liturgy in Jeannette’s honour. Interment to follow at the family plot in Bowsman Cemetary. Contributions in her memory may be made to The St. Boniface Hospital Research Foundation and the Swan Valley Music Festival Association.